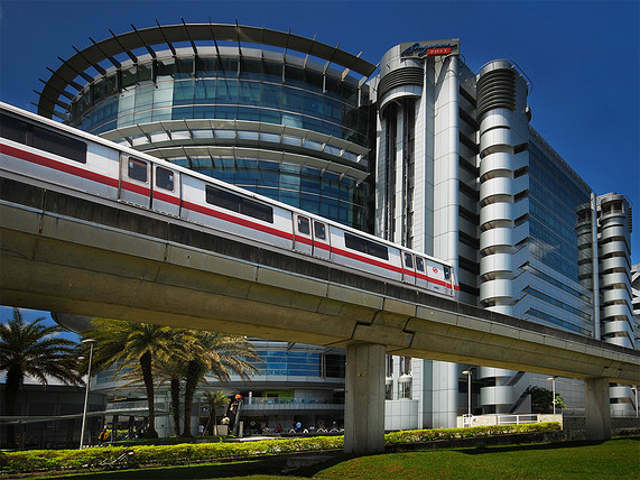 The Singapore Mass Rapid Transit system (MRT). By williamcho. Asia is rapidly urbanizing, creating localized stress on the transport system. In 2011, for the first time in history, more Chinese lived in urban centers than rural areas and a similar trend is underway in India. Combined with urbanization, vehicle fleets across Asian countries are increasing exponentially owing to urbanization and rising incomes, doubling every 5-7 years. Road congestion costs Asian economies 2-5 percent of Gross Domestic Product (GDP) each year due to lost time and higher transport costs. At this pace, energy use in Asia is likely to double by 2050, according to IEA projections. Unchecked, the repercussions of unsustainable transport in Asia have global implications. Greenhouse gas emissions from the transport sector will continue to rise, which is already the fastest growing source of CO2 emissions in Asia. The Asian Development Bank (ADB) forecasts that the region’s share will rise to 31% of global transport sector CO2 emissions by 2030 at its current pace, with total regional emissions projected to triple by 2050. Asian cities now have among the highest air pollution levels in the world and traffic accidents account for nearly 2,000 deaths a day. On April 24, EMBARQ presented a background paper at the 7th Regional Environmentally Sustainable Transport Forum in Asia on the role national governments in Asia can play in realizing the shift to sustainable transport. The key messages apply to countries around the developing world. According to a recent ADB report, an estimated $2.5 trillion of investment is needed in Asia by 2020. Currently, around $1 billion is invested annually in transport worldwide. Recognizing this need for increased investment in sustainable urban transport, in June 2012 at the Rio+20 meeting, eight multi-lateral development banks (MDBs) voluntarily committed to shift $175 billion to more sustainable transport programs over the next decade. While the $175 billion commitment by the MDBs is a major achievement, $17.5 billion per year is merely a fraction of transport investment needed. To change the current transport funding paradigm, multi-lateral development banks and national governments will need to embrace sustainable transport in national level planning. Private investors will need to collaborate with public entities to channel funding to sustainable projects and local governments and cities will need to show strong demand for sustainable transport finance. National governments can play a crucial role in financing sustainable transport systems. They facilitate domestic finance through national development banks and develop urban transport plans that direct development strategically. They coordinate international finance through MDBs and international investors and act as an intermediary between funding sources and city and local governments, which have an understanding of the projects needed at the local level. National governments can play an important role in establishing and overseeing monitoring and evaluation programs, building technical capacity nationally and locally, and sharing best practices between national governments abroad and local governments domestically. The EMBARQ background paper identifies two key sets of actions that national governments can implement to have the greatest impact on shifting transport finance towards sustainability: leveraging financing and increasing the effectiveness of existing financing. For a true paradigm shift to occur, transport finance must be leveraged to support sustainable transport projects. National governments link international and national financing through strong domestic policy frameworks that strategically invest in sustainable projects that address domestic goals on greenhouse gas emissions, energy security, and public health. National programs can also engage the private sector by improving the regulatory and legal environment. India’s next Five Year Plan (from 2012-2017) relies on the private sector to provide 35% of urban transport investment. Historically, private sector investment in transport in India has primarily gone to ports and airports and not urban rail or urban roads, which can improve mobility and accessibility for masses of people. The future investment opportunity for sustainable transport had to be further explored in discussion between national government and the business community to enable a transparent policy framework. Local funding sources – like road user fees, parking fees, vehicles taxes, and congestion pricing – can also provide innovative sources of financing for sustainable transport projects. In Hong Kong and Singapore, the rail and land development model has successfully financed profitable mass transit through innovative land development. Combined with correcting national fuel subsidies, these local sources could raise financing for sustainable projects at the local level. There are also key ways that sustainable transport financing can be more effective through national government action. Governments can streamline the institutional process for funding local projects by coordinating funding, planning, operations and private actors around sustainable transport projects. They can do a better job learning from individual projects by conducting needs assessments, policy formulation and planning, monitoring and ex-post impact evaluation. National governments also play a key role in consolidating information, building capacity for developing and implementing sustainable transport plans, and developing the technical capacity to evaluate project alternatives at the local level. Regional and global trends underway highlight the importance of rethinking transport in a sustainable way. Transport finance directs global transport development and national governments fulfill a central role in realizing sustainable transport finance. Regional forums, like the EST Forum in Asia today, enable international cooperation between national governments by convening transport ministers in a collaborative environment. Bringing the ministry of finance to future forums would strengthen the dialogue and allow a better understanding of the economic challenges and financing opportunities enabling sustainable transport. By leveraging transport finance to increase the magnitude of sustainable investment and through improving the effectiveness of available financing, national governments are a vital component of the shift towards sustainable transport currently underway. View Holger Dalkmann’s full presentation on Slideshare from the 2013 Regional Environmentally Sustainable Transport Forum in Asia, entitled, “Financing needs for sustainable transport systems for the 21st century“. Towards a vision of sustainable transport – Today’s decisions matter!